USB - am I converted? The SPDIF output stage is based around the Wolfson WM8804 chip and JK doesn't give many more technical details. The unit comes in a Hammond style case, and is nicely finished in black or silver with black end panels. On the front panel there are two push-button switches. One powers the unit on, and the other turns the internal battery charger on and off. It is particularly useful to see if the unit or charger is on in this case as it is easy to stop listening and forget to power down the converter, only to return for the next session and find the battery is depleted. However, there appears to be no disadvantage in having a power supply connected while playing music, so unless you are using the Mk3 as a portable device, it is probably best to keep the power supply connected permanently. JK supply a fairly full set of instructions that can be downloaded from their site. They also provide a comprehensive guide to computer audio, and optimising your set-up for best results with the Mk3 (or any other sound device). 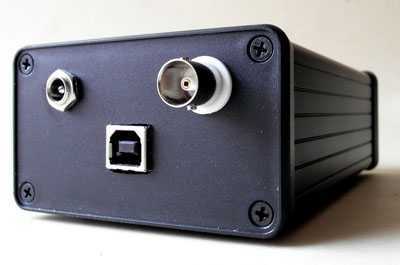 On the rear of the case there is a socket for the 5v charger power supply, a USB socket, and a BNC connector for SPDIF out. I was pleased to see that all the JK equipment uses what many of us consider to be the superior SPDIF connector! 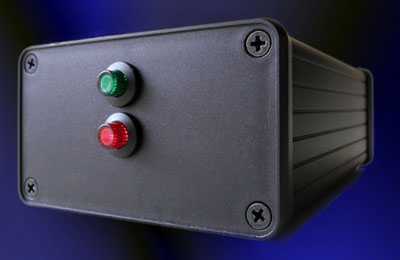 The Mk3 is a modified M-Tech Hi-Face, and the appropriate driver must be downloaded and installed for it to work. Driver installation was straight forward and only took a few minutes. 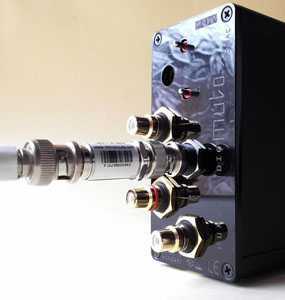 The SPDIF Mk3 is connected to the computer via a USB lead but as our readers will know, there is some controversy about USB cables perhaps even more so than with interconnects and speaker cables. My review of the mega-expensive VertexAQ cable caused quite a stir! 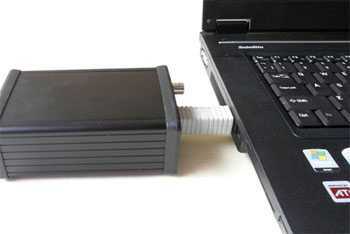 In an effort to avoid the possible variable effects of a USB cable John Kenny suggests attaching the Mk3 directly to the computer using an adaptor (see picture below). The unit is small and light enough not to make this a problem unless there are adjacent USB sockets on the computer that are also in use. In that case it may be possible to connect the unit using an adaptor that has a swivel joint. I tried the Mk3 with both a (1 metre) USB cable, and directly connected via a (rigid) adaptor, and actually preferred the cable. Why? Well, I reckon that rigidly coupling this small piece of equipment to the computer is also coupling it to the (greater) mass of the computer, and its mechanical noise. Thus any benefit derived from removing the cable is outweighed. I'm sure that others will report differently but for this review, my findings are based on using a cable. The output of the Mk3 connects to a DAC, and for the review, I used it with the Human Audio Muto, the Harmony DA09, and the MHDT Stockholm DAC's. The computer source was a laptop running Windows 8 and JPlay, and I also used Foobar2000 running on the same machine. We don't have to cast our minds back very far to the days when you could hear various people saying that ones were ones and zeros were zeros, and therefore if we heard a difference with digital audio, it must be in the analogue stages, or in our minds. Then we understood more about jitter, and perhaps we will discover other factors that influence the quality of a digital signal. Anyway, the sound of the Mk3 is clearly different from the dear old Trends UD-10 USB converter that I had first heard nearly six years previously. Of course with technology moving ever forward, and the UD-10 costing only 90 dollars, that shouldn't be too much of a surprise, but the Mk3 also sounded slightly different to the (similarly specified and significantly more expensive) Human Audio Tabla that I had on hand for comparison. Comparing the Mk3 to the venerable Trends UD-10, the sound was more mature, less digital, and richer tonally. Partnered with the Human Audio Muto DAC, the sound quality is very good with a large airy presentation, massive amount of detail, and good PRaT. However, I very slightly preferred the Tabla/Muto combination for some reason, probably because there was a very slightly richer tone to my ears, and a fractionally firmer bottom end. I also found the same when I partnered the Mk3 with the Stockholm DAC, and a Harmony DA09 DAC. I thought that the bottom end improved fractionally with a couple of pieces of granite on top of the SPDIF Mk3 to add a bit of mass, but still didn't match the Tabla.